Dan has been shooting competitively since December 2012. Dan holds a classification of Master or higher in all IDPA Divisions and is an IDPA Safety Officer. 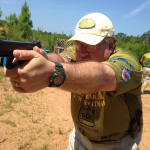 Dan achieved his goal of becoming an IDPA Distinguished Master in 2015 and a 2-Gun DM at the 2016 IDPA National Championships where he won the Revolver Division. 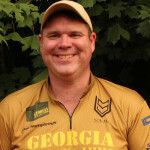 Dan is a NRA Life Member, NRA Instructor, Glock Certified Armorer and Instructor, a member of GSSF and Georgia Carry. When he isn’t shooting he enjoys spending time with his wife Sarah and sons Chase and Jack. Clint has been shooting competitively since 2012. Through dedicated training Clint has moved up the IDPA ranks quickly earning the Master classification in the SSP Division by winning the Division at a sanctioned match. 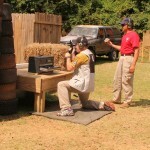 Clint achieved his goal of becoming a three gun master in IDPA in CDP, ESP and SSP. When he is not shooting Clint owns and operates his own electrical and plumbing business and enjoys spending time with his wife Caley and son Carson. Christopher is a Gunsmith who completed his apprenticeship in Austria and has been working in the firearms industry for over 22 years. He moved to the US in 2004 and has been working for a major handgun manufacturer since. In January 2013 Christopher started competitive shooting and by November achieved ESP Master as well as Division and Class Champion titles in various IDPA State Championship Matches. In his spare time he enjoys working on his cars and spending time with his wife Daniela. 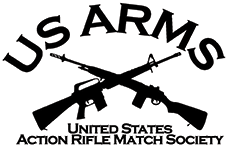 Wayne has been a firearms enthusiast since the age of 6. 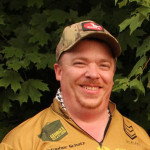 He started shooting competitively in 2013 and has the goal of moving up to Expert in the ESP Division of IDPA in 2014. Wayne is a NRA Life Member, NRA Certified Firearms Instructor, NRA Range Safety Officer, and IDPA Safety Officer. In his spare time he enjoys hunting, fishing, camping, and working on cars.